The economic recovery in Europe certainly seems to be well on track and getting a lot of positive press comments compared to the economic performance of the UK. Gross Domestic Product (GDP), a measure of the market value of all final goods and services, rose by 0.5% in the 3 months to March this year and by 0.6% in the subsequent 3-month period to end June. This virtually guarantees that year on year growth will exceed 2% in Europe this year, the first such occurrence above 2% since 2010. Data from Markit’s Euro-Zone Composite Purchasing Managers’ Index (PMI) edged up in August to 55.8 from 55.7, slightly above the Reuters estimate of 55.5. PMI is considered a good guide for economic growth, with anything above 50 is viewed as expansionary for the economy. The strong PMI data was partly driven by the manufacturing sector clocking its best month of growth in six-and-a-half years in August, offsetting the weak growth from the service sector. This adds support to the notion that activity is in full swing but one aspect overlooked is that producing goods is different from selling them. If goods produced are not sold they end up as stock or they become discounted items. Growth in Europe has come from factors that can fluctuate substantially. For example, industrial production contributed 0.2% to the headline growth figure, a factor which tends to be volatile from quarter to quarter. Furthermore, there has been rapid expansion in countries such as the Netherlands and Spain which could falter if goods earmarked for purchase by overseas buyers become increasingly expensive due to the strength of the Euro (which we explain below). Healthy economic data has been filtering through to the Euro, which has now strengthened to an eight year high against Sterling; with one Pound now only worth 1.09 Euros. Many are now wondering if we will see parity (meaning one Pound would be equal to one Euro) before the Brexit negotiations are settled. While the Euro has strengthened 7.1% against a basket of leading global currencies, Sterling has depreciated 9.3% against the same basket since the result of the EU referendum vote. Currency strength is a potential headwind for Europe. It places companies reliant on export trade at a disadvantage versus competitors. Price pressures within Europe are now virtually non-existent. Therefore, going forward, it seems likely that either the Euro will lose support or exporters will have to innovate or accept a hit to profits. It looks increasingly likely that Europe will have to rely more on domestic demand to sustain growth in GDP. In our chart below we show that a decline in the value of the Euro last year coincided with a pick-up in GDP but this effect has now fully unwound. 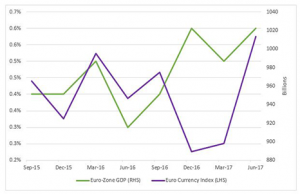 Recent currency strength places greater reliance on demand within Europe and domestic led growth and we know that the effects operate with a lag. Europe needs growth to generate ongoing-sponsorship for European integration. The idea that the European Central Bank can remove monetary support now looks premature. In conclusion, and by way of contrast, UK exports have gained a competitive advantage. This is particularly helpful at a time when Brexit negotiations continue to evolve. 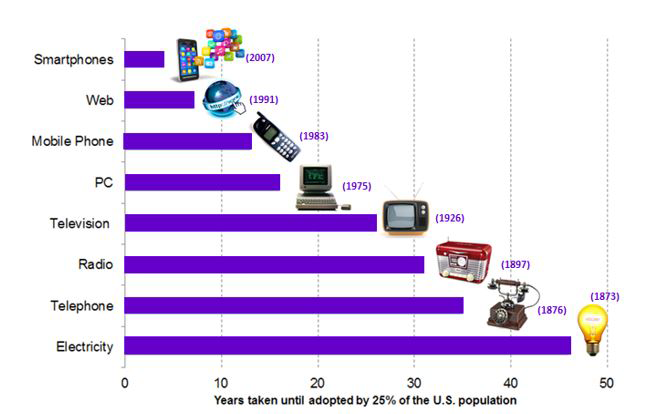 The world has evolved significantly over the last hundred years, with cryptocurrencies, smartphones and electric cars. All of these developments have seen extraordinary growth in the past two decades. In the early 1990’s there was a big push for fuel-efficiency and low-emission vehicles. After a number of stuttering years electric and hybrid vehicles are beginning to make headway within a very competitive automobile industry. The knock-on effect has accelerated demand for commodities used in the production of rechargeable batteries. Based on Tesla’s Model S, electric cars require approximately 100 pounds of lithium carbonate. Growth in demand for electric cars is rising rapidly on a global scale, from almost nothing, to more than half a million vehicles in 2016. 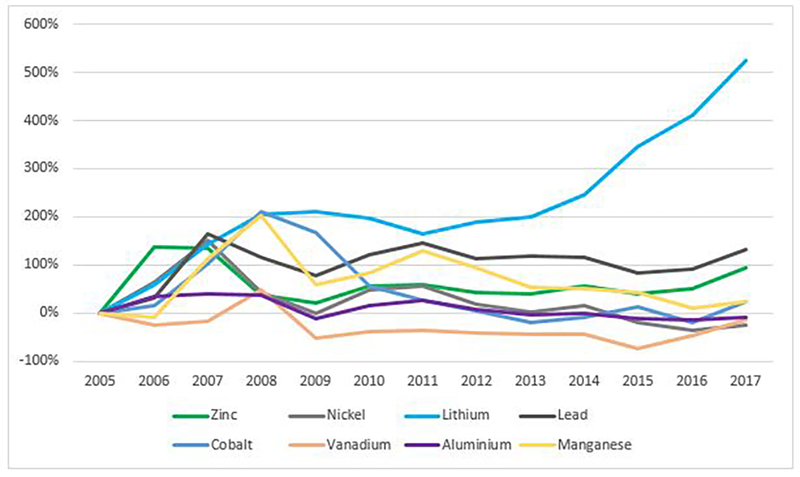 Resultant demand in battery components, such as Lithium and Zinc, is higher than ever. 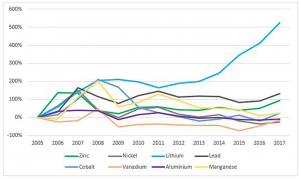 From the chart below, it is clear that the growth of Lithium’s price has outpaced all other commodities used to make batteries. If electric cars continue to take larger market share each year, the demand for commodities is expected to keep rising. According to the US Department of Energy, annual plug-in electric vehicles (EV) sales are forecast to increase by over 3400% to 20 million by the year 2030. If this is correct demand for Lithium-ion will increase 21.7% year on year, which is a phenomenal growth rate. However, the pace of technological advancement is such that substitution may only be a matter of time although it is not yet known what new materials will replace Lithium, Nickel and Cobalt to power a new generation of electric vehicles. 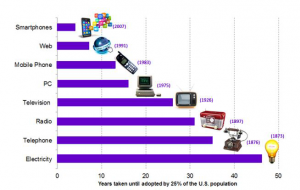 Technological adoption rates have become much faster in today’s globally interconnected world. Even though electric vehicles represent just 0.8% of total car sales in 2016, according to Tesla, electric vehicles may capture around 28% of total car sales by 2030. This would make adoption of electric vehicles slower than the adoption of smart phones and spoil the trend of ever faster adoption for each new technology. However, with incentives for fuel-efficiency and governments setting targets for lowering emissions, adoption of electric cars may be faster than many think possible. In Norway, where a 25% VAT tax exemption is available on electric vehicles, the adoption rate is 10 times higher than in most markets. In Norway electric vehicles represent 42% of all new car sales!